Posted byMei 11 April, 2011 2 March, 2019 67 Comments on Help! 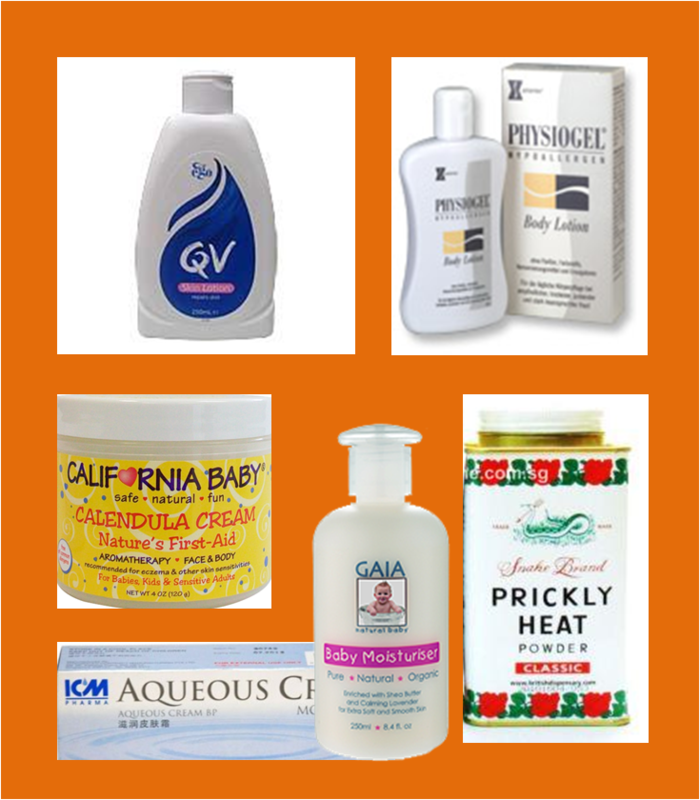 What moisturiser to use on your eczema baby? Navigating through all the moisturizers out there to find the right one for your baby can be a nightmare. My baby Marcie has tried various lotions and creams (I remembered when the household budget burst due to many trial and error purchases and our cabinets stacked full of different moisturizers) and finally settled on using Physiogel AI cream, Physiogel body lotion and QV body lotion. As you are figuring out which moisturizer to use, it is important to remember the one advice that I had from Marcie’s doctor, “You Can’t Moisturize too Much”. Whether over the internet or on product labels, I have this conclusion after trying to no avail to sum up the pros and cons of different moisturizers – We, as parents and layman, can’t figure out from reading the information available. I have tried at least 3 times to make sense of all the information out there, including comparing all the ingredients, and given up (all three times). I can only let you know that Physiogel and QV work for Marcie which are also recommended by Marcie’s doctor (I didn’t accept any advertising fees from these two brands and neither do I see these brands sold at the clinic that Marcie’s doctor works in). Physiogel AI cream works quite well but due to its high cost, S$35 for 50ml, I only use it on her face and after swimming. Physiogel AI cream is able to neutralize free radicals which when produced in excess, damages skin cells. Physiogel body lotion also works for Marcie but also due to its cost, I use when her rashes are affecting her badly (on top of using mild steroid). On a daily basis, liberal amounts of QV body lotion is slathered on Marcie and her infant care teachers have also been reassured not to worry about slathering too much. Aqueous cream which contains emulsifying ointment, paraffin and preservatives – I tried this as it was recommended by a friend’s dermatologist but it hasn’t worked for Marcie. She scratched the area and was crying with frustration the two nights we applied for her. Also read that some doctors say this cream will cause thinning of skin over long period of use. Both the organic cream, California Baby and Gaia Natural Baby, are gifts from friends. Read that organic does not necessarily mean non – allergenic as some people can still be allergic to the organic ingredients. Also the use of the word ‘organic’ is not regulated. Calamine lotion – not suitable as told by a doctor whose kids have allergies. I think it’s because one of the key ingredient, zinc oxide, absorbs moisture and that’s why it doesn’t help to moisturize the skin but helps to dry up weeping wounds. Prickly heat powder– not suitable as told by same doctor above. My own guess is that it doesn’t have any moisturizing function. In general, lotions are more easily absorbed but not as long-lasting as creams. For me, I prefer lotion as Marcie is too fidgety for me to have the time to get the cream from the tub (and ensuring no contamination) and apply over her body. Do persevere in moisturizing as dry skin leads to itching and do so liberally all day and immediately after your baby’s shower. Update: Almost a year after writing this post, I’ve interviewed a dermatologist Dr Verallo-Rowell for a 13-part Sensitive Skin Product Series, and in this post, she provides the list of ingredients and their different names to avoid. Can my baby use physiogel AI cream on her face as she only 1 month old? Pls advise. Thanks. Yes, we used AI cream on our daughter’s face and body. Do keep the face clean, without using wipes or excessive wiping (that may further dry or irritate skin), do check out this interview with dermatologist Dr Jessica Krant on washing face! Thanks for the reply. Now I am confidence to use it on her face. How long should I use it on her? 1 week? I am worry that AI cream is too strong for 1 month old baby. How about newborn baby who is just 2 weeks old? Will physiogel AI cream too strong for them? AI cream is moisturizing, without steroid content, thus can keep using. It is encouraged to moisturize newborn babies (3 weeks old), in particular those who are at higher risk of eczema due to family history. See this post on the research study, mentioned in my interview with dermatologist Cheryl Lee – it’s considered one of the significant studies as it proves that there is a preventive effect against eczema from moisturizing. Hope all get better soon! my kid has eczema and dr prescribed sensitelial emollient care cream..any idea about this? ?was using physiogel lotion before..it was fine..but once a week needed to apply steroid.pls hepl..also is cream good for face than lotion?? Hi! Thanks for dropping by my blog; I haven’t heard of sensitelial, but you can use these posts as a guide to assessing the cream. My 4-year daughter started to have eczema at the sole and spread to the whole body thereafter. Tried QV, eczerra, emu oil, TCM cream, cetaphil and ceradan. Only the last works. It’s available at CGH, KK for $43.30 @80g. May try physiogel A1 cream as cheaper (available at TTS for [email protected]). Thanks Alvin for your sharing, and understand trying different creams, been through the same. We tried a sample of Ceradan cream and seems to work quite well but it has a bit of a smell that my daughter doesn’t like. Did a post comparing different creams, it’s quite hard to figure it all out but I kind of concluded that Physiogel is quite ok, on balance for its pricing, (less) number of ingredients and (less) number of irritants. Thanks! I shall explore Qoo10 too; have always bought when they package their creams together in a bundle of 3. That work out cheaper than other offers they have like 2nd for 50% off. thanks mei for your reply. appreciate it! Welcome! I’m using the QV intensive too, ever since my K2 gal protested against moisturizing, so figured use a longer lasting one for her. Nothing special about the cream, just that it has no water, so last longer. Hugs! Thanks for dropping by my blog. Heard of Curel, it belongs to ceramide/lipid ‘replenish’ (don’t know what’s the right term for it!) but basically similar to the more expensive category of creams that work on improving the skin structure rather than just moisturizing. I heard positive feedback on it but I’ve not used it. As long as it’s within your budget because no matter how good the cream, it’s no use if you use too sparingly due to budget constraint. Or you can use both an expensive cream with a basic moisturizing one, which is what I do. Given how dry eczema skin is and how much lotion/cream/ointment is required, it’s impossible for our family budget to just use the expensive ceramide/lipid-type cream. hi, how about physiogel (hypoallergenic) cream? does it work as well as physiogel al? also, how about ceradan? anyone has any experience with this? thanks! I do use both the normal physiogel and the AI version. Both works as a moisturizer. The AI is more expensive as it has ceramides/lipids that is what dry skin lacks. Ceradan belongs to the same category as AI cream, works too. So, it’s more of a matter of affordability. Paying more to get a cream that works to rebuild the skin structure, but any cream that is used non-regularly is not going to help. For me, if my child’s skin is dry/itchy, I may intensively use an expensive, ceramide cream and when is ok, switch back to normal good quality cream but not ceramide-type. Dry skin needs lots of moisturizer – not sustainable to my household to use only ceramide cream in that ‘abundance’. I use QV flare-up cream on my 5 years old son when he got a flare – up. Is it safe to be used? Hi Pey Pey, thanks for dropping by my blog 🙂 I looked at the ingredients of QV flare-up, and it doesn’t look very different from the normal QV cream so I suspect it could be a higher % of glycerin which had been studied in certain articles to be more moisturizing. I don’t think there is thus un-safety to the flare-up cream, as long as your son is not hypersensitive to any of its ingredient (e.g. there is paraben in the QV flare-up cream, in low %). Is your son’s eczema serious? If it’s mild and more intensive moisturizing can calm the flare-up, then that’s the best. However, an angry flare-up does need more than just moisturizing to bring down the inflammation. One question, is it ok to apply Physiogel AI on raw eczema? Because when I put yesterday, he cried so I guess its painful.. Thats the reason why I prefer to put like Unicity Green tea oil, its easier to put on his raw skin.. I think it’s ok. Oil doesn’t protect the skin, though it relieves the itch. Moisturizer has the function of trapping moisture within skin and protecting the skin barrier, and I think oil doesn’t do that function that well. Is he scratching bad? Distracting him helps? My son is only 4 months now so too young for allergy tests.. Is it recommended to received immunizations during flare up? When I ask poly, one says yes, one says no.. I nearly felt irritated..
Hi Pinkshadow, not too sure about immunization and flare-up – don’t think there’s much connection. The only thing is (my own guess) immunization that triggers fever may worsen the rash because increased temperature frequently causes eczema to flare-up. My daughter at that age had constant eczema on whole body, we just went through the immunization but was prompt to give fever med and to cool her body down. My son started to have Eczema 3 weeks ago.. GP ordered Hydrocortisone and Physiogel.. Doesn’t seem to improve.. Went to see poly and prescribed Aqueous cream, didn’t improve.. Eczema seems to get worst each day.. As of today, he has it all over his body but worst mainly in neck and face area.. Heard about Unicity products and last Sunday, started on Super Chlorophyll and Green tea oil. It dries up a bit and seems better than past few days but still eczema all over his body.. And starting to be very itchy for him.. i also changed his soap to California baby Super sensitive.. Hope I can find a more suitable products for my boy.. It pains to see him suffer in this eczema. Very interested to learn about wet wrap.. From SG.. Where is the place? at National Skin Centre, Mandalay Road 🙂 Let me know if you can make it, will then pass your email for RSVP to be confirmed (as per above post), cheers! Hi, my 4.5mth old son has eczema too. Been using QV bath oil? Physiogel AL and QV lotion and sometimes Aloe Vera jelly. Sometimes his skin ok, sometimes bad. Dunno what’s d irritant.. Anyway, I heard Atopiclair (can but fr Guardian) is effective. Have u tried? Thx for sharing soooo much! I haven’t tried Atopiclair and eczema comes and go, so it is difficult to figure out based on observation as there can be various factors triggering the flare, environmental, food, his own body like fever. Moisturizing (all the brands you using I’ve heard docs mentioning), within 3 minutes after shower, if really dry – try wet wrap. Swimming – can try that, read under tag – staph bacteria for why. Allergy testing at 6 months, so now can book appointment for consultation at hospitals/clinics with allergy testing – skin prick test for a start. Meanwhile, house dust mites (wash weekly in 60 deg C), pets, as for diet, unless you did note any very clear relationship of flare-ups, best wait till allergy test. Thx for replying. I bought Atoiclair yesterday from Guardian. $37 for a small tube! Anw, I’ll reply here if its good. My relative said its d only cream that’s works for her daughter. Btw, QV n Cetaphil products can be bought cheaper at shops like Venus and Beauty Language. Can save a few $$. Oh ya, I bought a Air Purifier for my son. Hope the lesser-dust air helps. Good to know 🙂 Yup, these creams seem kinda ex! Watch the humidity level.. I actually have a humidifier cos the air-con is too dry. Purifier seems not to really help my gal’s skin, in any case, she’s not allergic to anything so maybe that’s why! Thanks Jennifer for your sharing 🙂 I think Singapore’s pharmacy hasn’t started stocking honey cream yet, interesting choice! We use Calendulis Cream for flare ups, Manuka Honey Skin Cream for daily moisture, and Nablus soap for washing. It’s what works best for my son. You can take allergy tests in hospitals, normal GP or PD can’t prescribe such test. More importantly, after the allergy test, it will be followed up with doctor’s consultation. So, it’d be more of a question on where you would like to bring your bb gal to see her doc (someone you feel you can trust and within your budget). If she’s not allergic to cow’s milk, then my guess is not to do with the upgrade in milk powder. This can be tested via skin prick test. My girl doesn’t like milk powder, so we’ve been feeding her healthy diet since she can start solids, rather than rely on milk powder for nutrition. My bb gal also suffering from eczema, it seems to have gotten worst after upgrade her to 6mth+ milk powder. She was prescribed with Fucidin, Zaricort and Physiogel AI cream. Sometimes these medication helps to control it but sometimes out of sudden, it flares up again. I’m so desperate to find out the root cause now that i’m switching her to Isomil. I’m not sure if i’m doing the right thing. If this doesn’t work, i will bring her for test to determine what is it she’s allergic to. Any recommendation on where to do this allergy test? I have been using Irish Eyes by Lorena on my 6 month old for a few months now and it has taken away his eczema completely. I put it on him after every bath. I also use it for myself. I looked them up and their products are made in the USA! In Indiana. I live in New Mexico and have not been able to find their products in stores but their shipping is quick (like 3 days) They are very affordable too. “i also use physiogel for my baby since my boss gave me a sampler and i thought that the physiogel cleanser will be a good product to use on a baby. now, me and my other half are also using physiogel cream and lotion. im curious, would our baby really grow out from their eczema? around what age would this typically happen? Thanks Javvy with the translation! Children without allergy seem to have a higher chance of outgrowing eczema. The exact mechanism of how one can outgrow is not entirely known, likely due to immune system strengthening. Age wise, I think in grade school, and hopefully not recur in secondary school but happens to some teens due to hormones (having effect on eczema). i also use physiogel to my baby since binigyan kami ng sample ng aming boss at na pag isip ko na maganda pala sa baby ang physiogel cleanser…at ngaun pati asawa ko at ako ay gumagamit narin ng physiogel cream at lotion…. You should try Irish Eyes by Lorena body lotion and facial cream. It’s amazing. It has taken care of my eczema and extreme dry skin. It’s also much cheaper than QV lotion. I use the Milk Drench facial cream on my baby’s face to help with eczema and it works great. I still have a few bottles at home, but if anyone contact me after reading your posting, I’ll let you know. Cheers! Just to share. I tagged along a friend to order QV lotion. I just got my 1st lot last week, $28 for 1.25 litre. I understand Sin is selling 500ml @ $22+, cheapest I’ve seen on offer is $18. I ordered extra bottles to maximize shipping. If you are interested, I do have some to spare. PS: I’m not selling for business. I use Physiogel AI and from an eczema forum that I attend, the doc said it’s perfectly ok to use it before 6 months old. The reason why the label is written as such is because (if I remember correctly) some additional certification required to be labeled as for new born. Can I know which product you use on your baby’s face before she turns 6 months old? Because I read Physiogel AI only can be used for baby older than 6 months old. Currently my baby has eczema on face and she’s 3 months old. Not sure about zit-like dots, though Marcie’s eczema never turn zit-like. Zit, like acne? due to increased sebum? Read this link http://eczemablues.com/tag/product-label/ lots of info on sensitive skincare products. Hi, this is a great website, and your dedication as a mum really inspires me. My 4 month old son was diagnosed with eczema a month ago. He has it mainly on his face, scalp, behind ears and neck area. I have a few questions hoping you can give your opinion on based on your experience. I moisturise him with Jonhsons baby Sorbolene cream these couple of days, I have used Dermaveen and Qv balm, cetaphil before which seems to make it worse..qv lotion was quite good but he was still scratching. Have you tried Johnson’s Sorbolene cream? Our doc also prescribed cortisone cream 1% to use..but I’m reluctant to use it on his face..and him being so young. This week we are trying Lonicera ( traditional Chinese herb) boiling it with little water and dabbing inflammed areas with it…it seems to work but i am not so sure. This is what is happening after. 3 days of usage. The red inflammed area on his forehead and scalp (most itchy part for him) seems to have disappeared. But the zit like dots have increased around the temple area, mainly on the scalp between the ears and temple, kind of around the area of sideburns if he has them. Is this a worsening of the condition? Or the eczema is taking it’s course? Hope reading the above interview helps you understand the product better! Hi there, have you ever used Moogoo? From what I can see from the label, Physiogel AI cream has the ingredient Palmitoylethanolamide that is anti-inflammatory. There’s a clinical trial I’ve found on the web on it, helped improve eczema. A friend just passed me a tube of Physiogel AI cream and it’s working so much better than Aqueous. But it only helps me in my eczema, not my hives which comes together with my eczema flare up. May I know what’s the difference between Physiogel AI cream and Physiogel body lotion? Yes, it does come and go.. I don’t apply more than once per weekday and maybe twice max during weekend. Always sparingly. Usually, I may apply for few days, rashes go away and I stopped. If it comes back, we’d apply again. I believe it is safe, since we are using as prescribed and not treating the eczema is worse off. Are you coming for the support group breakfast at Tiong Bahru this Saturday? O you don’t use physiogel n qv baby oil daily? I brought my boy to NSC and they prescribed the cream exactly like your Marcie Pd. Maintain it. Does it happen to Marcie? Most cases of eczema start off as child, but may go into remission and come back later in life. It’s sort of a mystery, as I’ve even heard of 60+ mom with grand kids suddenly developing eczema. If the eczema cannot be controlled using moisturizer (i.e. one without potential irritants, please click on tag ‘product label’ to learn more), not using soap (but choose non-soap cleaner/bath oil), then you may want to see a doctor. Likely will be prescribed topical steroid at polyclinic, which is ok if used under doctor’s direction (you can click ‘steroids’ to find out more). Otherwise, you may want to get referral to see specialist at National Skin Centre or NUH..
Hope your eczema gets better! It’s sold in hospital pharmacies (NUH, KKH I know for sure) and some GPs who sell creams/thermometers etc may also stock it. Heard from another mom AI cream is 2 for $60 (vs 1 for $38) at KKH until end of month. Where can i get the Physiogel AI cream? it’s not sold in pharmancy. Some companies have excluded cocamidopropyl betaine from their ingredient or clearly labelling it, as it has irritated the sensitive skin of some of their customers. Cocamidopropyl betaine is a surfactant from coconut oil that decreases the surface tension of water, allowing it easier to wash your face. I read on the web today that propylene glycol and sodium lauryl sulfate may irritate skin. From what I can read from the ingredient label, Physiogel and QV don’t contain the above two ingredients. dr prescribed for my child sensitelial emollient care..Any idea about this? Physiogel is sold as Impruv in the US, by Stiefal Laboratories.